This is an image of my existence the last 4 days(last week). As a parent we often deal with coughs, runny noses and a myriad of things that arise with the health of our children. And I’m no exception. While thankfully my daughter is generally healthy, seeing her in pain is not something any parent is comfortable with. We had planned a snow weekend and drove to Bend on Friday afternoon. We arrived late and that night she tossed and turned all night. I attributed it to excitement of the weekend fun and she was acting completely normal all the way through breakfast and on the way to the mountain. I dropped her off at ski school with a kiss and headed to go cross country skiing. The call came just 2 hours later, from her ski instructor, saying she wasn’t wanting to participate in ski school. I turned around in the woods to start heading back to the mountain. I received a second call as I was walking up to the ski school building saying that my daughter had fallen asleep sitting in a chair and was in the nurses office with a fever. By the time I arrived, I knew something wasn’t right. I also knew it wasn’t the average cold or flu. We sat down together for a moment while they gathered all of her things and she was boiling. I could feel her fever radiating intensely through her stomach and neck. Within just a few moment of being in my arms, she vomited. I think she was so relieved to see me she relaxed just enough form relief, and vomited. Luckily it was only breakfast, not dinner from the night before. Then came the 5 day fever journey. As a naturopathic physician I am quite comfortable with fever and understand their benefit. I’m also comfortable with high temperatures knowing little ones are hot little bodies and they are quite normal. Despite all of this, when your child has 105+ temperature that continues for 3 days it is unsettling and stressful. Am I trained to realize this is probably a viral flu, yes, but when you see your little one suffering, your mind wanders. I started with my go to’s: Belladonna homeopathic, castor oil to the belly, Yarrow tea, massage to acupuncture points and ginger honey syrup in small doses. No change after 2 hours, the temperature kept climbing and my daughter was declining. On to homeopathic oscillocinum. No change and fever climbing. Still not even the hint of a sweat. 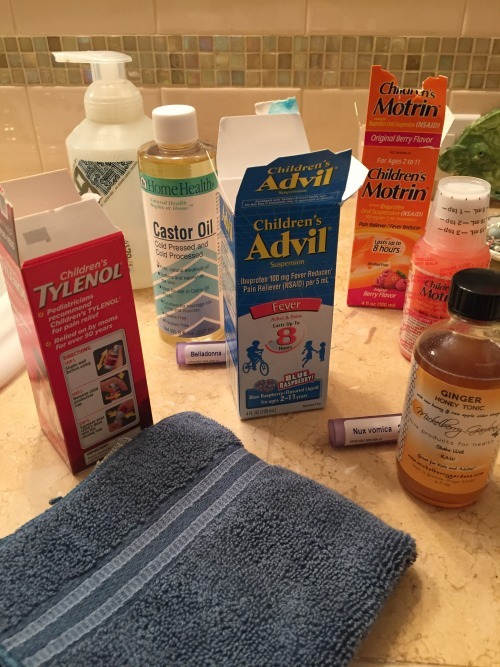 So I did it – I went for children’s Tylenol. Within an hour she was able to eat a few almonds and keep water down. But the headache she kept mentioning was relentless. She was tired, lethargic and glassy eyed. The temperature lowered to 102 with the medicine. And this began the cycle. Fever medicine, fever lowered a few degrees to make her comfortable, and then it would return with a vengeance climbing higher and higher. After a while when you are really in it, I began to question myself. Here I am a trained doctor, understanding both western and traditional medicine and I was completely forgetting everything I know. I was creating scenarios that were far fetched. Because I wasn’t grounded I was forgetting basic ways to care for her in a natural way. And the worst part was I was completely doubting myself and my intuition. I believe and practice natural medicine and lifestyle daily. Why did I quickly resort to OTC fever reducers instead of focusing on the treatments I know and recommend to others? While the fever reducers were bringing much needed relief of the suffering my daughter was experiencing, watching the medicine wear off and her slow and steady decline back to that painful place was hard to watch. I know that 105 fever is quite normal for little ones, so was I overreacting? Was I prolonging the illness by using these medicines? Research questions that theory, but my natural medicine background is skeptical. After trying other herbal, natural and homeopathic remedies, aconite and nux vomica, we were at 72 hours with 105.3 temperature. She had eaten and drank minimal amounts, lost 3 pounds and her fever was swinging depending on where she was in relation to her fever reducer medication. Despite having a bowel movement and still peeing somewhat regularly, we were worried. Upon arriving and getting in, we were glad we came. One thing I had noticed over the weekend that her torso was so hot, yet her extremities were cold. This was explained to us that her body as been under so much stress due to the fever that her body was going into protection mode and moving all blood to her torso. As a result of this, and the dehydration that was setting in, she was experiencing muscle cramping in the extremities. The other thing that was told to us is that the OTC fever reducer’s suggested dosing is considered very conservative and that often a bit more is needed to have true effects. This led to an immediate 20ml dose of children’s Motrin along with the request to take her jacket off to cool her surface temperature. One accompanying symptom was the chills that came on both before the fever mounted again, and when the fever reducer began to work. Her lips trembled and teeth chattered which causes the instinct to want to wrap up your little one. Unfortunately the best thing to do is to challenge her body to regulate its body temperature. The other thing we learned is that rotating OTC fever medications and/or combining them with high fevers is recommended by pediatric nurses. If you Google this question – it is often discouraged. In the ER we ruled out the following; bacterial infection including bacterial meningitis, a urine infection, strep, ear infection and H. influenza. All were ruled out and while waiting for the test results they gave her IV fluids. The mega Motrin dose kept her fever down for 8 hours (it actually lowered her temp to 96.7!) and in the early morning hours I needed to give a 10ml dose of children’s Advil. But, she finally slept consistently through most of the night with minimal waking. Day 4 – same same. Geez – isn’t this over yet? Fever reduced as long as on OTC fever medication down to 99, but after about 6 hours it begins its creep back up the thermometer. Good news is she is eating tiny “meals” and able to drink more then 2 oz. at one time without the fear of vomiting. The bad – I’m now completely dependent on these medicines to stay in a safe and comfortable zone. The other frightening thing is seeing her swing from fever, looking and feeling lousy to talkative and chipper and back down again. With not much to do, we watched a lot of tv, read a lot of books and napped. Day 5 – Still needed 2 doses of OTC fever reducer in a 24 hour period but was eating and drinking better then the day before. Energy slightly improved, definitely on the upswing. Day 6 – no fever! Wahoo! Still a bit tired, eating not 100% but getting there. So there is was. Our first intense long lasting, high fever experience. Of course I think about all of the things I would try in the future should this arise again, and how much stronger her immune system is for having gone through this. But- the true question I have is – will I do it the same if it arises again? Each day this week we’ll be focusing on the heart and self love. Today’s plant wisdom comes from the flower essence of Holly. Have fun this Valentine’s day with the herbal creation of a love cordial. Cordial is translated as courage for the heart and many recipes include heart tonics and herbs that quicken senses. These are meant to be shared with another, sipped in small dosages for pleasure and enjoyment. This scrub has a lovely, warm scent that is reminiscent of the holiday season. It smells so good you’ll want to eat it! Place sugar and spices in a clean bowl.